Hot on the heels of IFA, a new convention comes to town in AndroidPIT's home base of Berlin. This time it's a treat for gamers with the titans of the game industry, including PlayStation, Capcom, Ubisoft, Square Enix and more descending on the German capital to show off their tastiest future offerings. Of course, we couldn't resist. Ubisoft's flagship franchise goes Greek in Assassin's Creed: Odyssey, although not as far back as the title suggests. Not as many assassins as the title would suggest, either. Rather than the legendary mythic past of the Trojan War, Odyssey puts you in the shoes of a Spartan warrior descended from the renowned Leonidas I. After years of Assassin's Creed games, the formula is hardly surprising. It's an open world action-adventure in which we'll be running, climbing and stabbing to our hearts content, and the demo at EGX served this up in spades. Ancient Greece is rendered in breathtaking beauty, with sunlight glinting off the coast past lush, rolling hills. Taking on the role of male protagonist Alexios (in a series first, a female protagonist, Kassandra, is also available), I soon found myself falling for the game's mix of intoxicating atmosphere punctuated by brutal combat. Only a longer time with Assassin's Creed Odyssey will reveal if the spilling blood on the gorgeous scenery will get lost in the busywork that previous AC games have fallen prone to, but if you've ever had fantasies of being a classical hero, this is the place to realize them. Release: Windows, PlayStation 4, Xbox One on October 5, 2018. If there was any doubt as to who was the belle of the ball at EGX Berlin, there was only one game displayed on banners on the way into the convention: Resident Evil 2. And it's no surprise, as the landmark survival horror game still holds a special place in the hearts of many who were terrified as teens back in 1998. 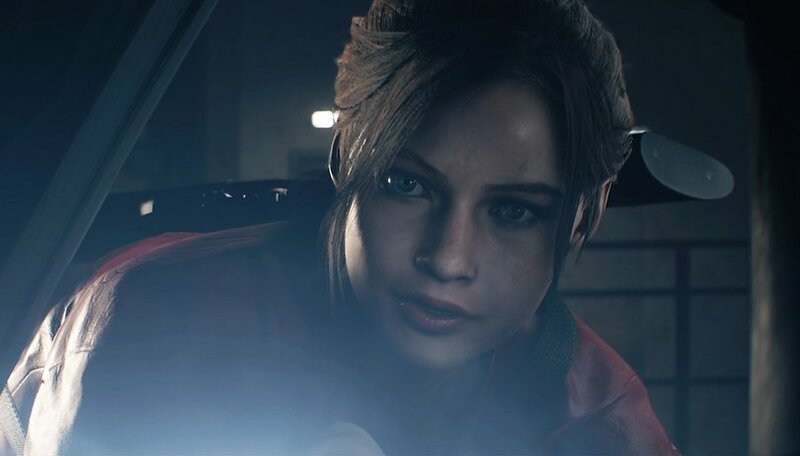 Capcom's upcoming remake takes us back to the terror of zombie-infested Raccoon City, with the story of Leon Kennedy and Claire Redfield re-imagined in exquisite (and grotesque) detail. Two demos of Resident Evil 2 were available at EGX Berlin, one for each protagonist. Leon's was a scenario from early in the game in which he first encounters the zombie threat in the police station. It was this demo that answered the question that was foremost in my mind: can Resident Evil 2 still scare someone today? I've played the first game and knew some of the major 'shock' moments that were coming, but the ongoing tension of survival horror...the tension, the claustrophobia, shining a small spot of light around in the darkness, worrying if you had enough health left to survive another zombie encounter, the constant sounds of creeping, bumping and creaking expertly paced...at the end of the demo, my heart was racing, and it had nothing to do with how gross the monsters looked with modern graphics. In just 20 minutes, Resident Evil 2 had reminded me in a very visceral way just how significant it was in the first place. Release: PlayStation 4, Windows, and Xbox One on January 25. 2019. Total War. Total War never changes. At least, my time with Total War: Three Kingdoms didn't do much to convince me otherwise. We've had samurai, knights, Romans, barbarians and Britons and even orcs, dwarfs and elves in the series' glorious mash-up with the Warhammer franchise. Now, Total War takes on the famous Chinese epic. At the hands-on, I played a scenario where my forces had to escape an ambush by enemy forces trying to pin us en-route. Use of different troop types and maneuvers such as taking the high ground for advantage, the devastating cavalry charge to the flank, and so on...so far, so Total War. Fun and challenging in itself, but more interesting will be game's treatment of the Three Kingdoms story, of which sadly not so much was shown. The final game will have two distinct modes, one with a more historical balance and another that fully embraces the fantastical and heroic elements of The Romance of the Three Kingdoms. If pulled off with character and flair, that's what will differentiate Total War: Three Kingdoms from its predecessors aside from flavor of soldiers and cutscenes, but the demo at EGX didn't quite show that off. Xbox had a small presence at EGX Berlin, with most of the games running on PlayStation and a few PCs. But it was still a significant one, with by far the longest line waiting for Metro Exodus. And based on the EGX demo, this hype isn't undeserved either. In the hands-on demo I took on the role of our hero Artyom, seemingly fished out of a river and resuscitated by helpful lady who quickly took off, I was free to explore and scavenge for survival in the post-apocalyptic ruins of the Russian Federation, 2036. And survival is going to be complicated. A lengthy introduction detailed all the different mechanics at play, including management of my gas mask, lighter and dynamo and what they're used for, various weapons that can be crafted and customized in detail, different secondary attacks...it was a lot to swallow all at once, but after I got started I found that it was enough to get by at my own pace. Exploring the wasteland, scavenging scraps, and tangling with an bandit outpost, I realized that this game, for a certain kind of personality, will be the death of free time. The methodical exploration and looting feels rewarding and the gritty combat is satisfying and bloody whether I was blasting away, throwing knives or skewering bandits with my crossbow. From first impressions, Metro Exodus is going to hit the spot for that deep sprawling single-player fix. I have to admit that I'm no Kingdom Hearts fan, and the obsessive devotion of the series' fanbase always left me somewhat mystified. The mash-up of Square Enix and Disney characters just seemed so...silly, and whacking things with keys didn't grab me either. And yet, Kingdom Heart III's Toy Story world won me over. This taster of Kingdom Hearts III was essentially a more polished version of the events in the above trailer, including (thankfully) the English voice acting. The animation and characterization was so superb that it you'd be forgiven for think that you were actually watching a clip from one of the Toy Story movies. The toy-ified Sora, Goofy and Donald Duck did stand out a bit next to Andy's toys, but Woody, Buzz and the gang were portrayed with plenty of flair. The demo stage was an exciting romp, with keyblade battles (complete with trademark over-the-top moves and summons) in Andy's room and on the streets of suburbia spiced up with assists from Toy Story characters, culminating in a showdown at the toy store where both you and the enemy battle with giant (for toys) mecha complete with jetpacks and guns. Yes, it's dumb, but if the other worlds of Kingdom Hearts III (based on Frozen and Pirates of the Caribbean among others) are going to be this fun, I won't care. Release: PlayStation 4 and Xbox One on January 29, 2019. What games are you most looking forward to play next year? Any of the big name franchises, or do you prefer more indie offerings? Re2 remake looking promising. Zombie dogs always scare me! For me, all Resident Evils with Leon are the best. Chris just makes it into a boring action game. Leon has more character, humanity & emotions. Re4, my favourite, as an example. Resident Evil 7's story caught me by surprise & it just feels so refreshing & scary to play. It's right up there with re4.